A number of American friends and colleagues — from Texas, Nevada, New York, and California — came out to taste with me “in Franciacorta” at Vinitaly. It was a blast and I honestly believe that everyone was impressed and sometimes surprised by the quality, character, and depth of the wines. Thanks to all of them (and stay tuned for a note or two from them). 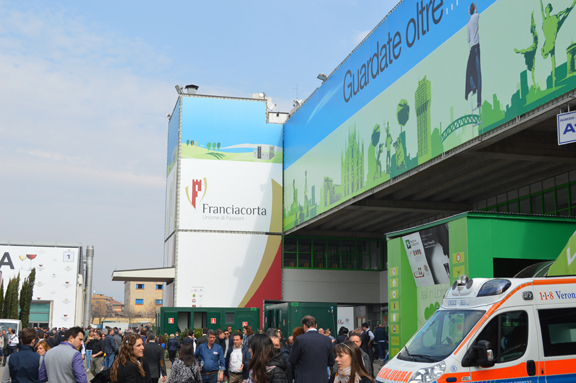 A number of people commented about how hard it is to get into the Franciacorta section of the Lombardy pavilion. On nearly every day of the fair, there were lines and security guards who controlled the flow of foot traffic. And it was often tough, even for people like me, armed with a press pass, to make their way to the front of the crowd to be admitted. It’s really due to the overwhelming popularity of Franciacorta at the fair. It wasn’t like this four or five years ago. But more and more, consumers are flocking to Franciacorta because they are thirsty to try the wines. Sometimes popularity can hurt you! Previous post ← Franciacorta Crawl today (Monday March 23) 1:30 p.m.